Happy Saturday everyone – isn’t it great that it’s the weekend at last?! Last month I was contacted by UK online retailer Fuse Fashion, who asked if I wanted to chose an item from their website for review. I wasn’t previously familiar with them; they specialise in fashion brands and the latest trends and although their range isn’t huge, there are a lot of great items to choose from (I changed my mind several times trying to decide what to get)! After much deliberation, I eventually chose the Feverfish Belted Cape** – and I’m so glad I did, because I absolutely love it. 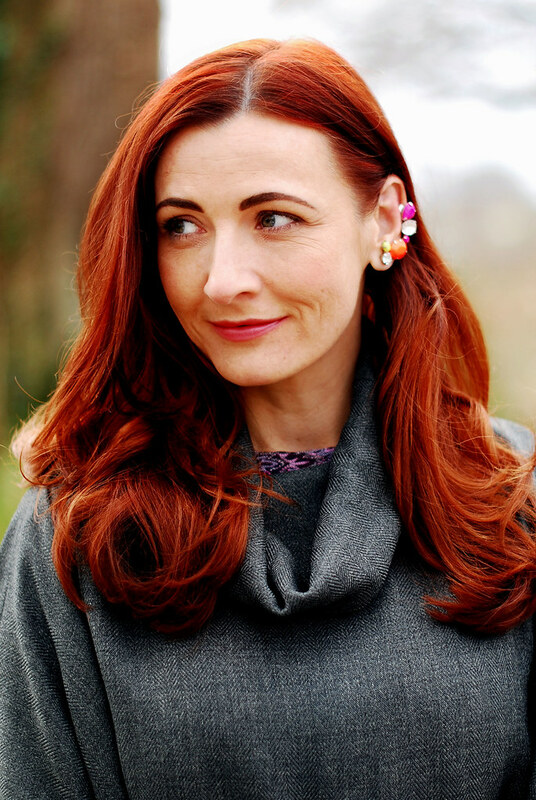 It’s nothing like anything I have in my wardrobe at the moment, and although charcoal grey isn’t a colour I’d normally go for (very subdued for me), I thought it would go so well with some winter brights and statement jewellery, plus it makes a great neutral backdrop for my hair. 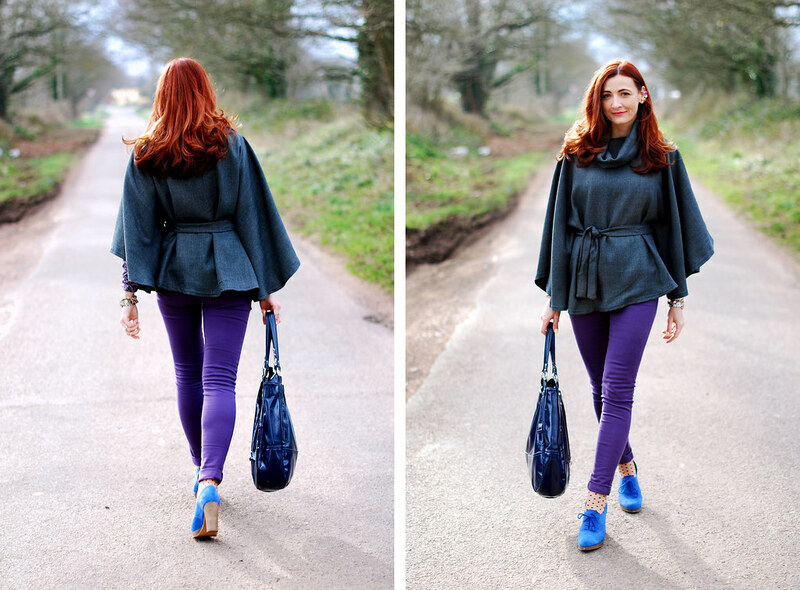 It’s the fabulous shape of the cape that makes the statement I think, and doesn’t need to be a bright colour as well. As I said I found it hard to choose one item – I also loved the Traffic People clothing range and nearly chose this olive green jacket, but realised I already have a cropped khaki jacket in my wardrobe, which was probably why I liked it…! P.S. Aren’t these neon cuff earrings from ASOS just fabulous?! Word of warning if you’re thinking of getting some: they really hurt your ear after a bit. Not something you can comfortably wear all day. But I still love them! P.S. If you’re not in the UK, perhaps you’re a US resident…? If so, don’t forget to enter the $1000 Visa card giveaway I’m hosting with 34 other fabulous bloggers. 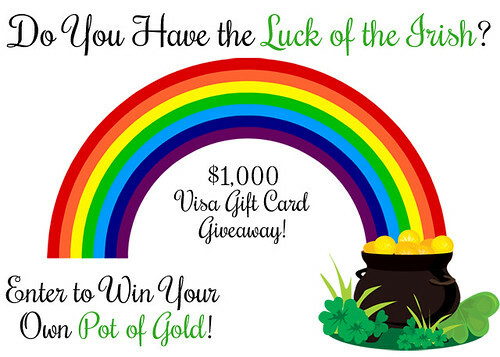 You have till St. Patrick’s Day (17 March) – go enter now! I received the item concerned as a gift and this post contains affiliate links. All opinions expressed are my own, however, and 100% honest. I am a huge fan of cape coats. They are effortlessly stylish. But can I just say that the combo of your pants, socks and shoes has me swooning? I'm pinning that photo for inspiration. I LOVE it! Fantastic outfit! Thanks for linking up with Wardrobe Wednesday and your feedback last week (you'll see I fixed the link!). 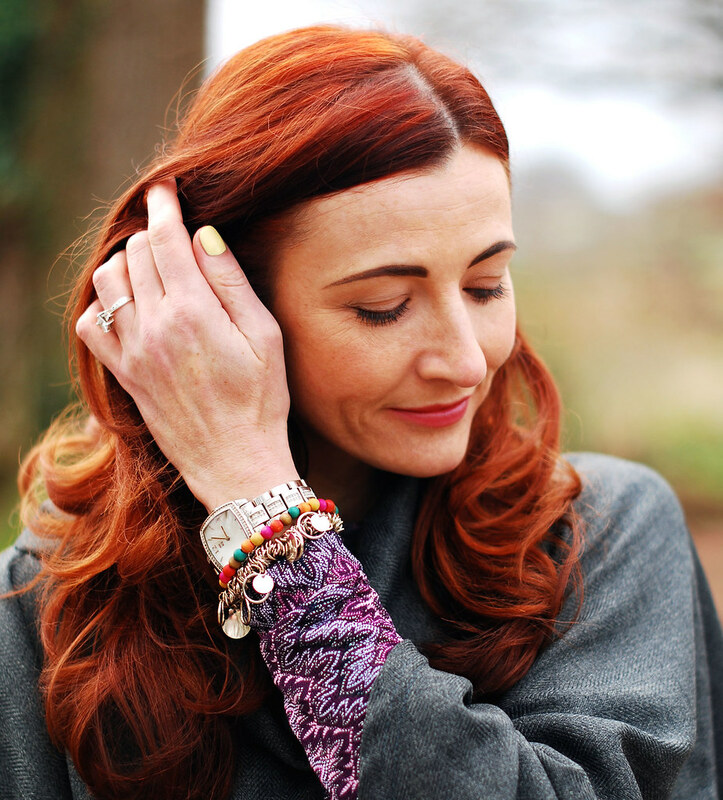 I love the details of your outfit Catherine – this week it's the socks and bead bracelet! Yup. High sophistication, and great with the brights. Love that ear-jewelry on you, with this outfit especially! You always look so beautiful. Your effortless mixing of colors inspires me. So the grey is a nice foil for the brights…I think you made the perfect choice! I have to thank you for so generously sharing your photography tips. I took your advice on how to shoot in bright sunlight and it made a world of difference! I never would have thought of shooting with the sun behind but it transformed the images and saved the day. The pictures made a wonderful post last month and I gave full credit to you on the post! The color of those shoes! Love it! Love your look! The color mix is amazing and the cape you chose rocks! Oh! These shoes are so good! And a peek of polka dot is the perfect way to perk up an outfit. OH WOW– I have no idea how all that alliteration just happened!! I have to agree…it is a fabulous belted cape! The whole outfit is so much fun!! the polka dot stockings are so cute! I especially like the details: the glimpse of sleeve, the polka dot ankles, the baubles at your wrist and on your ears. Thank for the heads up on the comfort factor, though. It's always good to plan. I am so loving your ear cuff. Your shoes and cape are fantastic. I love the peak of polka dots. I love how the tights are peeking through! Fantastic outfit! 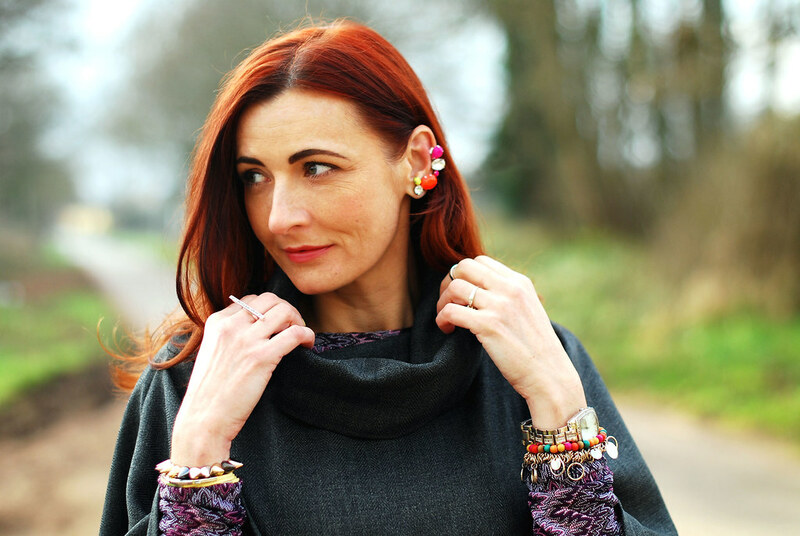 Your cape is fantastic, it suits you so well, especially paired with a lot of colourful jewellery! You are right, this cape is a very good background for jewellery. Those earrings might be pinching, but they look very good on you. Beautiful picture, especially with your hair. Love the purple jeans and the spike bracelet! holy smokes i think you made a good decision with the cape….i LURVE it!!!! omg those polka-dot socks are ADORABLE! love them! Good choice indeed! This cape looks perfect on you! That cape is ADORABLE! I love it on you! Love tayloring and fabric, great choice!